Foreword. Introduction. Review no. 29: Weather. Subject index to Weather. Review no. 30: Water. Subject index to Water. 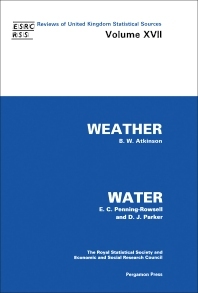 This volume reviews statistical information held in a variety of sources in the UK dealing with weather and water. In view of the influence of weather and water supplies on industry and environmental quality, this text will be of particular interest to researchers in these fields. For students and researchers of economics, geography, meteorology and physics, and environmental studies.